Software for AmigaOS, AROS, MorphOS, MAC and Windows platforms. 1. Fast, light and efficient clipboard manager. 3. Add watermarks to your pictures. paste again in other program. 7. Capture pictures, video of any size (The video is placed in the video folder), capture the full desktop, or crop any image. 8. Capture images with timer, for example: pop-ups. 9. 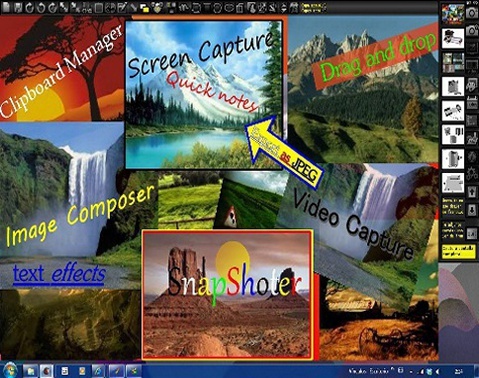 Image composer mode with infinite layers to put images, texts or graphic primitives and make compositions. 10. Scale, rotate, put border, change contrast, add transparency, use text or arrows in the collage mode. 11. Infinite layers to play with your images in real time. 12. Save the collage as JPG, PNG, BMP, GIF or ILBM image. 13. You can delete or add files directly the captures drawer, snapshoter sort all those files and prepare it. 14. Languages English, Catala , Spanish, Turkish, Italian, Portugues brazilian, Norwegian and French. 15. Drag n drop picture files to the clipboard bar and automatically you have all the images ready for work. 16. Paint, compose, create, and a lot more. 18. RGB custom palette for primary secondary and gradient colors. 19. Infinite layer image mode. The image blinks to locate the selected layer and make easier the location in the collage. 21. Can be launched automatically when the OS boot. 25. Full advanced clipboard over the cloud store system (Using Dropbox). Share any image or text file between devices anywhere. 26. Fast export or copy of the clipboard from the list to manage it.